If We Want It Now, It Will Be Now! Rabash, “What is Because of Impatience and Hard Work in the Work”: We need to work hard because it is only the sufferings of hard work that make us cry out to the Creator with a whole desire that the Creator will save us from the dominance of Pharaoh, the king of Egypt. This means that it is from a state of lowliness that a person senses that he feels worse than all the other people and this pushes him to cry out to the Creator with all his heart so that He will help him. But he believes that the Creator hears his prayer since He has revealed his evil to him and so He will surely help him and take him out of the evil too, which is called redemption. This means that he believes that the Creator let him understand that he is in exile and He will surely take him out of exile afterward. We advance by two forces, but for those who don’t know where to go, there is only one force that pushes them from behind and forces them to move forward. They are constantly trying to escape from it, trying to be saved from the “roller of evolution” that catches up with them from behind and pushes them to advance. 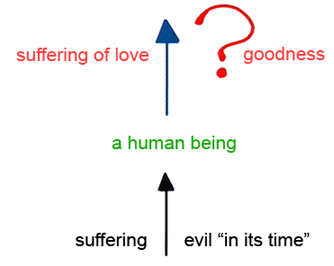 But the path of the Torah is different from the path of suffering. A person is given the wisdom of Kabbalah so that he will build up the force that will illuminate before him and will pull him, in the hope for a better future, with great hopes, positive examples, a feeling of awe that is felt by the connection and spiritual elation. The goal must be as glowing and as attractive as possible, and depicted as wonderful and good. Although the advancement is by the ego, which we must constantly reject, we have to try to use this method: to draw the Light that Reforms, so that it will do all the work. The approach here requires subtlety, like in anything. If you know how to enter it, then it is very easy for you to do it. Someone who doesn’t know this feels great difficulties and constantly runs into a wall. We have to arrange the right environment in which you will soon begin to suffer because of the lack of connection and because of your envy, lust, and desire for respect. You will see that others are more successful than you. You will envy others that succeed in connecting so strongly and you will also want to attain that. The envy forces you to demand your change. You already know how to evoke the Light that Reforms, you begin to change under the influence of the Light, and thus advance. The main thing is to develop the drawing force that is called “I shall hasten it.” It is because the troubles, the sufferings, the natural force of evolution “in its time,” is not up to you. We should understand that the sufferings come to a person in order to wake him up; we need to develop the pangs of love by ourselves instead of corporeal sufferings so that instead of the evil that catches up with us, the goodness will illuminate in front of us. Instead of the natural course in the grip of time, we should rise above time in order to determine the pace of our advancement by ourselves. This means that it is all in your hands! We have to feel elation and a sense of awakening since it all depends only on us! If we want it today, it will be today! If we really want it now, it will be now! Everything that we want to attain by the path of the Torah can be promoted and achieved. It is very important to emphasize this in the work: to operate and integrate all the components, all the means that we have in the way of “I shall hasten it” that will help us advance. We have to develop all the means and to connect them correctly in order to see that there is certain method here instead of following the path of suffering by developing under the pressure of our nature. A person can advance by rising above nature in order to advance before it and to open the gates for it. Baal HaSulam, “Introduction to The Book of Zohar,” Item 20: And the same “body,” in its bad form that is given to us in the present, this too does not spoil our essence as this and all its properties are about to be annulled completely together with all the system of impurity that is its source, and everything that is about to be burned is as if it is already burned, and is considered as if it never existed. The essence of the soul (Nefesh), clothed in the body, is merely at this stage of desire, but the desire to bestow is derived from a system of four worlds of ABYA of sanctity; it exists eternally, because this form of the desire to bestow is in equivalence of form with the source of life and is unchangeable. We exist in the reality of Ein Sof (Infinity) and all the worlds (olamot), meaning the concealments (alamot), are only filters that adjust the picture of Ein Sof for us; the degree of concealment exists only in our perception and they will vanish the moment we are able to annul our body,” the desire to receive for itself. However, this desire still needs to be revealed. Where does it really exist? In fact, today all my desires are actually acting at the beastly level. The real desire in order to receive is revealed only when I begin to work in order to bestow and find out everything that is opposed to the desire to bestow. Opposing the right line, the left line is revealed; against sanctity, impurity is revealed. Here below, under the line of spiritual perception, we are in the imaginary world where our desires, as it is said, “All look like beasts.” But if by work in the group, in dissemination, in connection, for friends, for humanity, and finally for the Creator, we reveal our inclination toward Above, then we reveal our corrupted “body,” meaning the desire to receive with the intention to receive. In order to correct this desire, the intention needs to change to in order to bestow. The desire to receive itself stays and above it I build a desire in order to bestow that is called soul (Neshama). Its essence is in my bestowal to everyone. By giving to everyone, loving everyone, I develop the soul above my “body.” And in this form, we are reach correction. Then this world disappears, and I can see all the worlds to the world of Infinity. Now we also exist in the world of Infinity. And now, too, everything depends on my intention. Nothing is immutable and constant, as everything is being depicted and happens only in my qualities. Question: As much as a person is in more adhesion with the Rav, the group, and study, then his desire to receive grows more? Question: So how do we restrict our desire? Answer: I do not restrict the desire itself, but rather the use of the desire. I don’t want my desire to become smaller or to completely disappear. No, I relate to it with all the respect that it deserves, with love not hate, because it is help against it. I deliberately work on myself in this manner of recognition and try to guard the limits of my desire in all my discernments. They become a real treasure for me, and I give them high regard. Then all my life becomes something very important, precious. In front of me, as if in a game, parts of this very complex mechanism are passing and I do not neutralize them, do not restrict them; I want to rise above them. This is the ascent, the rising in the spiritual ladder. The restriction itself is made by the Light and I do not do the work of the Light. That would be like asceticism and there is nothing good about that. We need to receive the things as they come, rise above them, and then use them in the correct form. Question: How does it happen? It is very easy to drown inside a desire. Answer: I ask all the time to be in faith above reason, in the middle line. My desire that I rise above is the left line; the bestowal that I achieve is the right line. And the order of the mutual relations between bestowal and receiving is called the middle line. This mechanism rises higher and higher as if by a jack. Saturday (Shabbat) is a special day that signifies an association of Zeir Anpin (the sun) and Malchut (the Earth). Saturday is about connection between the Earth and the sun that happens when the sun completely fulfills the Earth at the end of a six-day cycle. The moon also participates in the connection between them because the sun and the moon, the so-called “two great heavenly bodies,” are equally important, although the moon shines by reflected sunlight. Between them there is the Earth that covers the moon from the sun and so we see the phases of the moon that represent the relationship between the moon and the Earth, and the sun reflects the magnitude of their pairing and connection. “Six days” stand for the pairing of Zeir Anpin and Malchut. When Malchut, the Earth, reaches a state of a complete saturation, then on the seventh day it rests. It applies to Malchut, the Earth, to all human beings and even to animals, to the entire world. But this doesn’t mean that a person should rest because Saturday is the most intense time in our spiritual work. After six days of Malchut’s correction (during which she tries to become similar to Zeir Anpin) they unite, merge, and couple. “Saturday” denotes love and connection, which is described in the “Song of Songs,” a complete merging of the creation with the Creator. “Six days of work” stand for six days of “pumping” and preparation for merging. Each of us rotates in phases of their own as the sun and the moon: We get up in the morning and go to bed in the evening. On the seventh day, we are ready to merge since the seventh stage is about love; it’s the stage of a complete correction for the sake of achieving similarity with the Creator. So, the first five days of the week are working days; the sixth day is a combination of the first five days together into one, and the seventh day finalizes the entire work and demonstrates its result, completely a non-working day. As all of this comes only from a comparison between the right and the left lines, the seventh day was immediately accepted by Abraham’s group (the Jewish people) as a day of rest. Other nations followed this example and also established days off for themselves; that was done through their religions, which derived from Kabbalah. Taking into consideration that Saturday is affiliated with the middle line, Muslims (the right line) picked up the sixth day of the week as their day off, whereas Christians (the left line) chose to have a day off on the first day of the week. This discrepancy will stay intact until all of them meet and unite in the middle line. If it doesn’t happen, we won’t attain the Creator. This explains that the purpose of all religions is to make people realize that they have to rise above these deviations and connect in one single point that has nothing to do with religions at all, but rather with Kabbalah.